Identity and social justice: can we all get along? Do You Have A Return Ticket©? is a must read. 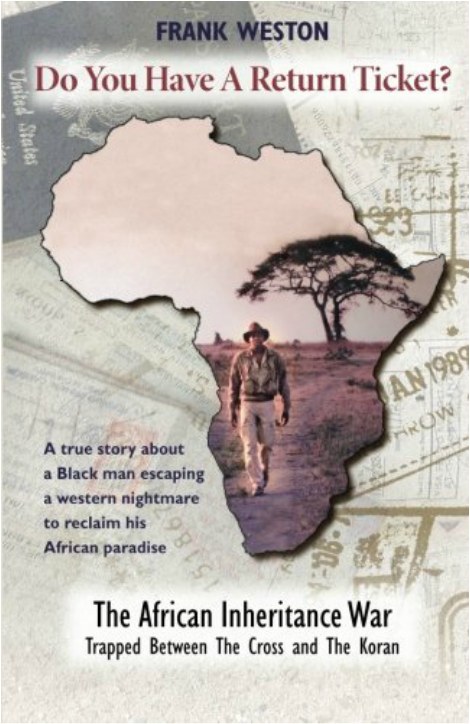 In this changing world this is my story, an epic story of one Black man’s quest to return to his beloved motherland, Africa and reclaim his birthright, his dignity, his land, his wealth and his future. If you believe in the six degrees of separation, this is your story as well—at least you will find large parts of your own story embedded in these 319 pages, these years and centuries. So come along, take the journey with me not backwards into the mangled remains of my African past but into the future our future. NOW on Amazon.com, click the Buy now Button below or book cover to order your copy NOW!!!!!!. 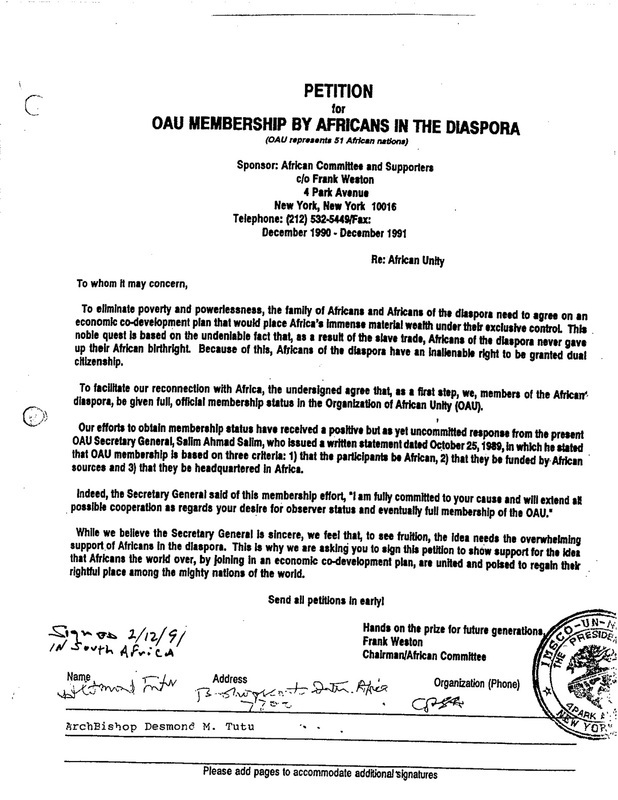 for exile African Diaspora people in the AFRICAN UNION. African-Americans pooling efforts to assist the development of Africa. The World President of the International Multiracial Shared Cultural Organization (IMSCO) was received in audience by the Prime Minister of Cameroon on Tuesday the 23rd of April 2013. On behalf of the Head of State, the Prime Minister, Head of Government, His Excellency Philemon Yang granted audience to the World President of IMSCO on Tuesday the 23rd of April 2013 at the star building, in the person of Mr. Frank Weston, following the signing of a Convention between the Non-Governmental Organisation and Cameroon. 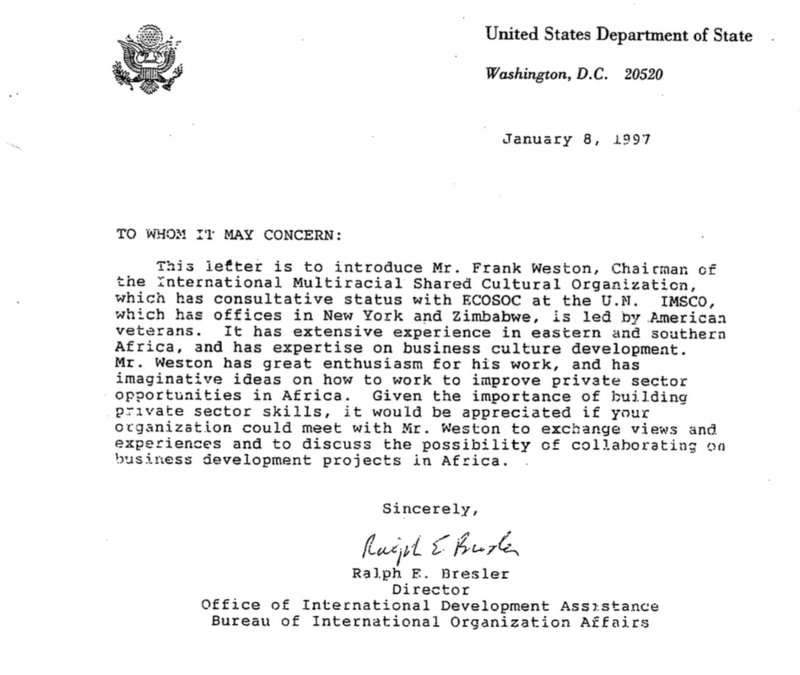 Accompanied by four other members of the group, Mr. Weston told their press after the audience that the plan was to open a branch of the organization in Cameroon entailing the facilitating of the return of the economic gains of African Americans to the continent, and particularly to Cameroon. In very precise terms, the New York-based Organization is envisaging substantial investments by Black Americans in various domains including ICTs, energy, education, infrastructure and health, an economic power estimated at more than a billion US dollars. In return, his organization will import natural agricultural products from Cameroon to the United States of America. Actually, IMSCO and the Government of Cameroon on the 18th of April 2013 signed a Convention by which the Organization has been authorized to operate in Cameroon. So far, the NGO which has carried out activities in other countries has contributed to the construction of social housing in Central Africa, namely in the Congo. Frank Weston CEO IMSCO and the Minister of External Relations (Cameroon) re-planting the seeds for the extended African family business culture signing the IMSCO Republic of Cameroon Establishment Agreement April 2013. 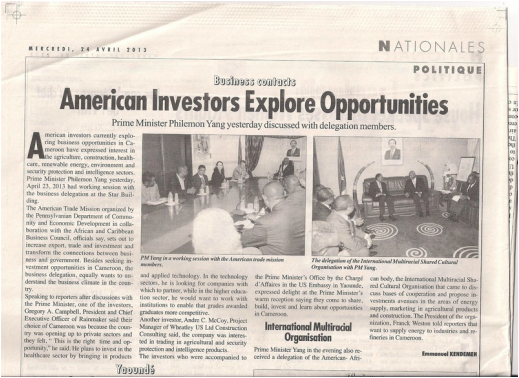 IMSCO CO-DEVELOPMENT AGREEMENT LINKS 20 MILLION CAMEROONIANS AND 5055 MILLION AFRICANS IN DIASPORA. Cameroon Minister of External Relations and IMSCO CEO Frank Weston signs IMSCO Establishment Agreement April 18th 2013 linking 20 million Africans to 5055 million African Diaspora community property businesses and trade links. The historic IMSCO project is designed to place African people's (partners) in control of Africa's families businesses, trade links and future. "Africa's future will be determined by African people." Kofie Annan. IMSCO President Frank Weston sign Establishment Agreement. 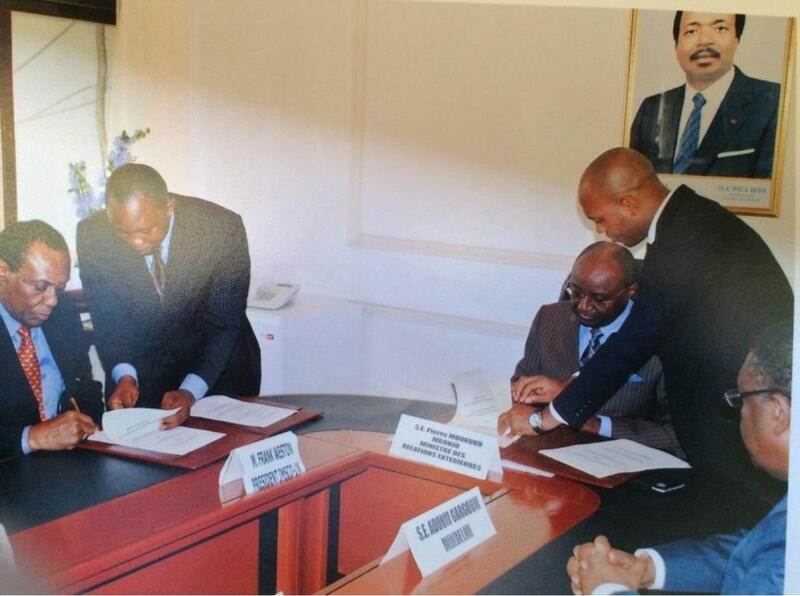 IMSCO President Frank Weston sign Establishment Agreement, (Accord) April 18 / 2013 with Cameroon government worth billions of Euros and US dollars in trade business and jobs. The photos: Minister of External Relations S.E. Pierre MOUKOKO MBONJO (Cameroon) and IMSCO President Frank Weston sign historic Establishment Agreement insuring diplomatic and business cooperation between a billion plus Africans. Only Black Man can give Black Man Power! As predicted by the African ancestors it has come to pass. Africa and its global African Diaspora powerful people are asked to stand up lead by our wise and youth for Africa to take its rightful FIRST PLACE in the world of business and trade. Blessed with vast land, near endless resources and wealth Africans and Africans across the Diaspora are called on to team and co-manage all private business and trade entering and leaving Africa. Leading the way is IMSCO an ECOSOC United Nations African owned and managed NGO approved to operate in 193 nations. IMSCO extends this welcome to all Africans and descendents of former enslaved African Ancestors to step up. IMSCO teams worldwide are implementing a Co-Development Plan (Co.D.P) for one billion plus global African family members. (Proven allies welcome.) The (Co.D.P) plan reaches from Yaoundé, Cameroon the two Congo’s, South, West, East and North Africa, South America’s Brazil’s 180 million powerful African Diaspora, North America’s most powerful African Americans, Europe and Asia extending into every earthly African home and slum. IMSCO and the teams call on all forward thinking African to step out of the shadows of western and foreign imposed bias economic and marginalization into the light of power and vast African wealth and opportunity. Take ownership-managing control. Rebuild an African Africa! Share the vast wealth where you stand or better yet come home where you belong and are badly needed. Let’s get back to work people and re-establish our EMPIRES! One richest African man and woman is not near good enough! Frank Weston President of IMSCO and Republic of Congo Ambassador sign IMSCO and The Republic of Congo Establishment Agreement in Congo for trade and economic co-development honoring African Diaspora and African people co-ownership of Congo wealth and property. See details by clicking on the Frank Weston Congo button below. 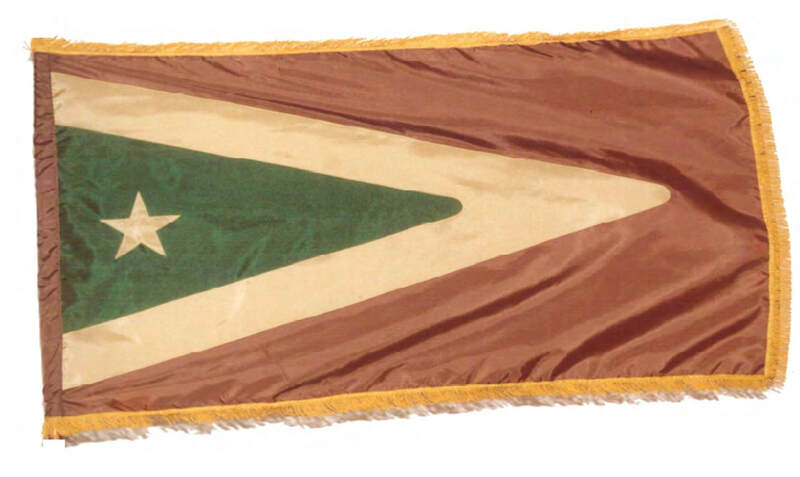 Dual Citizenship for exile African Diaspora family as a human right. Its about winning, you and 6 degrees of separation. IMSCO is introducing this motion picture to the United Nations to introduce how this innovative project attracts the corporation of major international movie stars as well as the public worldwide in coming together to help raise millions of dollars in awareness to assist the United Nations in carrying out the Millennium Goal. The proceeds from the movie will all go to fund IMSCO's aims to link opportunities through education and culture to help promote equal rights in political awareness, resource sharing and co-development projects to help end poverty and injustice. IMSCO is a 501 (C) 3 IRS certified charitable organization with a reach and intent to operate in 192 countries around the world for the people and communities IMSCO serves. Man in the Mirror an epic film made between 1970 and 2007 about the human struggle to find a natural sustainable place in society; is a path breaking motion picture by Frank Weston who produced, directed, wrote, and acted in this farsighted film. The film stars Martin Sheen, who appears in nine roles. That is remarkable enough, but Michael Dunn appears in his first starring role. Moreover, the film stars one of the first black actor-comedians on network television, Johnny Brown. MAN IN THE MIRROR available to purchase on Amazon - BUY IT NOW!! click the Buy/Rent Button below.